St. Louis ChessI’m gonna need another Red Bull. Last weekend, Magnus Carlsen successfully defended his title as World Chess Champion, defeating challenger Vishy Anand in 11 games. 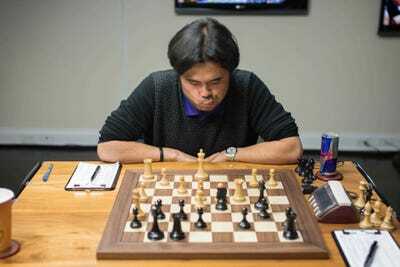 Meanwhile, in St. Louis, the U.S. number one, Hiraku Nakamura, took on Levon Aronian of Armenia in an exhibition match. Aronian has been number two or three in the world for several years now and was the guy everybody expected to be playing Carlsen for the WCC in 2014, before he sort of fell apart at the Candidates Tournament. Nakamura has been steadily ascending the rankings, although he has a terrible record against Carlsen. His stated goal is to be the World Champion and to that end, he’s taking a few pages from the Carlsen book. Specifically, he’s trying to obtain sponsorships from companies not normally associated with chess. Carlsen is sponsored by, and models for, G-Star Raw, a Swedish clothing company (wearing its threads, he was certainly the first person to play for the World Chess Championship while wearing fashionably ripped jeans). 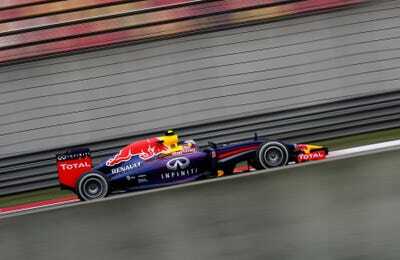 Nakamura recently hooked up with Red Bull, better known for sponsoring Formula One racing teams. This actually makes a lot of sense, for several reasons. First, a “classic” chess match between two Grandmasters can last six hours. 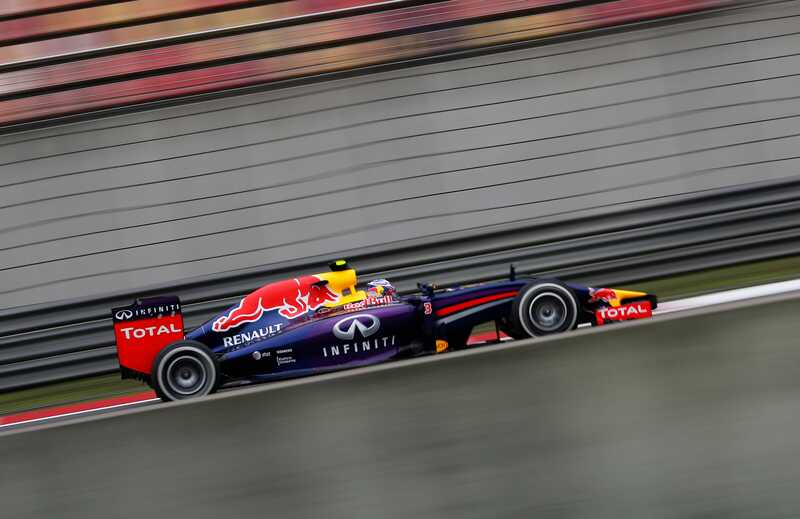 That’s six hours for a brand like Red Bull to display its product on webcasts, which are avidly watched by chess fans globally. Second, chess is becoming much more a “performance” sport. Gone are the days when GMs could chainsmoke their way through games, before retiring to the bar to mourn a loss or celebrate a victory with seven or eight scotches. 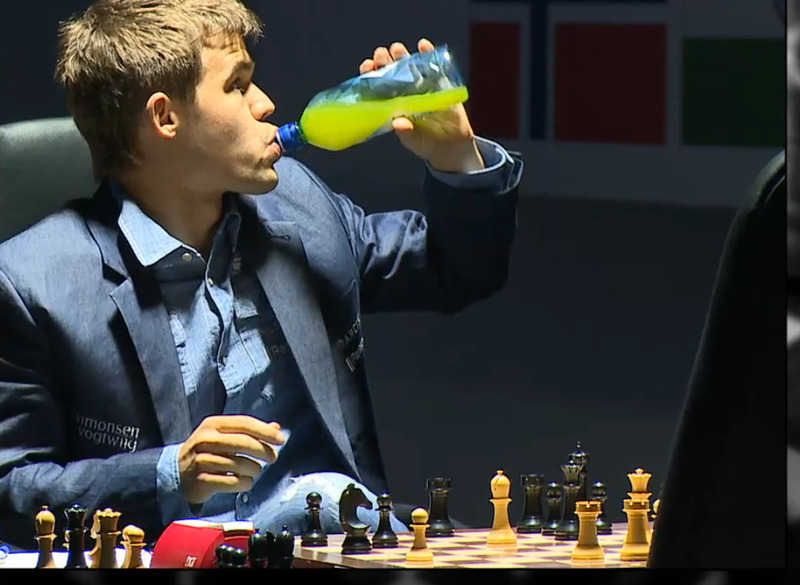 Carlsen is in great shape. The top players all routinely train physically for big tournaments, knowing that they may have to concentrate for half a day in one sitting. Finally, players can drink whatever they want during a game. Most drink water, fruit juice, coffee or tea. Carlsen is famously a guzzler of orange juice. Even Anand, a tea addict, switched to orange juice for most of the WCC match. Red Bull fits nicely with Nakamura’s slightly gonzo attitude. Modern chess has taken a highly cerebral turn, aided by computer analysis. Aggressive, attacking chess can be a liability. Nakamura, however, prefers to play in bold manner. An in-your-face manner, to be honest. In addition to being the best U.S. player, he’s regarded as being the greatest player of “bullet” chess who has ever lived: that’s chess played with a 1-minute time control. It’s insane. It’s the Red Bull of chess. [T]here are quite a few players who, when I play them, I just want to crush them. There are people who when I sit down across from them, I just want to destroy them. I don’t want to use names, but let’s just say, there are two players on the top 10 in the world who every time I sit down across from them, I just want to destroy them. 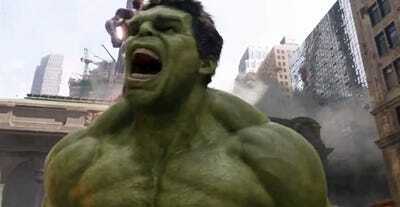 Nakamura — he’s the Incredible Hulk of chess.